The research conducted in our group is focused on using mathematics to gain insight into the complex biological world around us. It involves developing mathematical models of a biological systems, solving the equations of those models, analyzing the results, and translating the results into a scientific context. The two main biological systems/areas that we focus on are blood coagulation and the fluid-structure interaction between microorganisms and their fluid environment. We are active members of the AMS Math Biology Research Group. From left to right: Ada Palmisano, Michael Kelley, Nicholas Danes, Alison Wallbank, Vivian Wong, Karin Leiderman (not pictured: Forest Mannon, Michael Stobb). 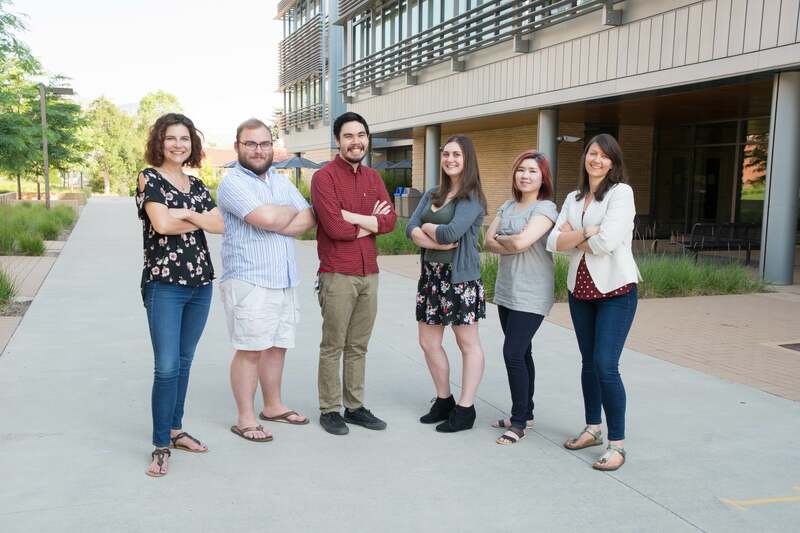 Recent graduate/members of my group are Terese Thompson (graduated UC Merced, MS 2015) and postdoc Hoang-Ngan Ngyuen. Individuals with the bleeding disorder hemophilia are deficient in certain proteins found in blood plasma necessary to produce stable blood clots; they may still form clots but they will take longer to form and will likely be less stable. Our mathematical model was able to predict clotting time-courses in agreement with in vitro measurements for hemophiliac blood. With that validation, we are now working to answer more specific questions about observed patient variability in hemophilia, i.e., why do two individuals with similar plasma levels have significantly different bleeding tendencies? This project is a collaboration with Prof. Keith Neeves in Chemical Engineering at Mines. Many drug companies utilize mathematical models to help with predictions of therapeutic outcomes and design of drugs. Current mathematical models of static (test tube) coagulation do not quantitatively reproduce in vitro experimental results except under very selective conditions. We are developing an accurate model that is experimentally validated in stages of increasing biochemical complexity. We are employing an uncertainty quantification approach to incorporate both experimental and parametric uncertainty, statistical inference to estimate biochemical reaction rates directly from raw experimental data, and a likelihood approach to uncover novel/missing biochemical schemes. This is joint work with biochemist Dr. Dougald Monroe (UNC Chapel Hill), mathematician Dr. Suzanne Sindi (UC Merced) and graduate student Mr. Michael Stobb (UC Merced). The scientic theme of this work is to study the interaction of cilia and flagella with their complex fluid environments. For example, our group would like to know how the fluid environment influences the emergent beat patterns of cilia and waveforms of flagella. Answering these questions has important implications, some of which include improvement of aerosol drug delivery and a better understanding of the fluid mechanics of reproduction. Our work has mostly focused on the development of numerical methods to solve the underlying PDEs of the fluid-structure interaction problems. This is joint work with Dr. Sarah Olson at WPI.